Baby formula does not need to be warmed, according to experts from North Dakota State University. Nonetheless, your baby may prefer the taste and temperature of warmed formula. Newborns may reject cold milk or show signs of stomach upset after feeding on cold formula. At the right temperature, warm formula comforts your baby by feeling like breast milk. Where possible, warm your formula before giving it to your baby. Baby formula comes in powder or liquid concentrate form. 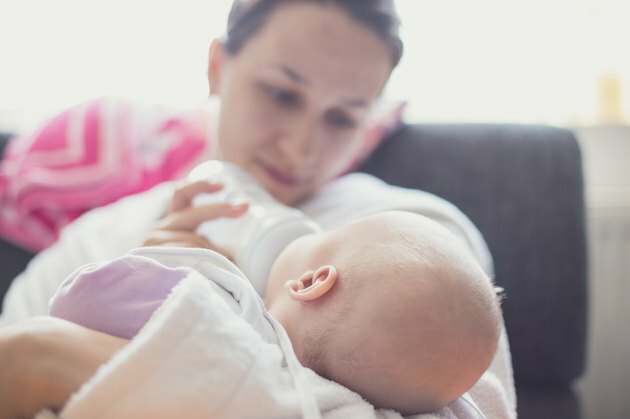 In both cases, quality baby formula contains a mix of proteins, minerals and vitamins designed to offer similar nutrition to human breast milk. Don't mix formula with cow's milk as this contains a different protein make-up than breast milk. Most formula mixes with fresh cool water from a tap or bottle. This makes baby formula very cold when first mixed unless heated. A woman's body temperature usually sits at around 98 degrees Fahrenheit. Milk straight from the breast has a similar temperature. Tap water temperature varies depending on location and the time of year. However, if you give a baby formula made with cold tap water, it could be more than 40 degrees Fahrenheit colder than breast milk. Babies are often happier feeding on warmer liquids. A baby feeding on cold formula has to use valuable energy warming the liquid inside her body to reach her own body temperature. Baby formula shouldn't be warmed in an open pan or made with warm water. Instead, the Ohio State University Medical Center suggests the safest option is heating the formula when in the baby's bottle. Place the bottle in a pot of warm water or run it directly under a hot tap as soon as it's mixed and ready. Bringing the formula to a boil inside the bottle changes the nutritional content and makes the liquid far too hot for the baby. Milk near boiling point can scald the lips and tongue. Powdered formula keeps safely in a sealed bottle in a refrigerator for 24 hours, according to the Minnesota Department of Health. However, if you warm the bottle, give a little to your baby or leave the bottle out for two hours or more, discard the formula. These situations can cause bacteria to grow in the formula or bottle. Though it's not always possible, the best option for your baby is freshly mixed and warmed formula. But, if you're unable to warm it properly, don't worry -- it's not essential to warm up baby formula.